I just finished reading Flying 7 Continents Solo, by Harry R. Anderson. He is only the fifth pilot to fly solo in a single-engine aircraft to all seven continents. Because it’s my dream to fly my family around the world, I read the book to get some perspective and insight from someone who has flown himself around the world in small airplane. 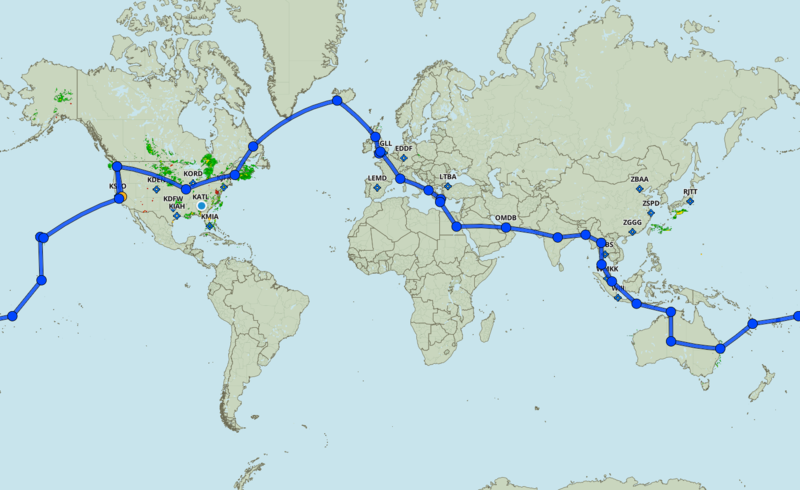 For the above trip, Harry flew his small airplane, a Lancair Columbia (averages 165 knots), nearly 25,000 miles in 164 days (although he hung out in the U.K. for 81 days to hang out with old friends). In all, he said such a trip would require about $50,000 and 3 months to complete. Harry has a PhD in engineering and is an entrepreneur. So I appreciated his perspective on many levels. His scientific orientation undoubtedly helped him to describe his journey with great detail. The book contains an appendix with several spreadsheets, aviation terms, and enumerated procedures on how to get permission to fly into, out of, or over particular countries. English is the standard language for aviation communication around the world. So Harry didn't have too many troubles communicating with air traffic controllers. There were a few instances in India and South America where local controllers spoke little to no English, but he was able to understand just enough to complete his flights. Also, while Harry seemed to have a great time flying himself around the world, I couldn’t help but wonder if he was lonely during the trip. He is not married and I don’t think he mentioned having any children. For my trip, I don’t want to do it alone. I want to take my family with me. As a family, we have already visited 48 states, backpacked through Western Europe, Visited Japan, China, and Australia. Because that is our rhythm, I couldn’t see myself trying to take a trip around the world without my family. One other thing about Harry’s trip that is different from the one I am dreaming about is that he pretty much avoids the whole continent of Africa. Being of African descent, I cannot see myself flying us around the world without visiting several countries in Africa. I know it will add significantly to length and cost of our journey, but for us, Africa is an inescapable must for our itinerary. To make such a trip, we would definitely need a bigger, faster, stronger airplane. Right now, we can fly about 750 miles per tank, but I would want to be able to fly at least 1000 nautical miles per tank. I would also need a plane that can carry more weight. Right now, fully fueled, we can carry a little over 900 pounds (people and luggage). For our flight, however, I would like a plane that can hold more than 1,000 pounds. Ideally, it will have a payload of more than 1,300 pounds. Given those requirements, I would probably need to invest in a Beechcraft Queen Air with an Excalibur Conversion. Another consideration involves the speed and service ceiling of the plane. During his trip, Harry encountered some icing on his wings, often at about 11,000 feet. Without de-icing equipment, he couldn’t fly in or above the icing layers, so he had to descend and fly at low altitudes (which, at times, made me uncomfortable). So, a pressurized aircraft that can do what the Queen Air can do, but also has the ability to fly into known icing (FIKI) at higher altitudes would be ideal for our trip around the world. Right now, the Cessna 414A is the plane that keeps standing out to me. In any case, I appreciated the journey that Harry Anderson shares. I’m sure I’ll return to his book again and again when it comes time to start requesting visas and permissions to enter and exit countries.